No Royalty Coffee Franchise? I Doubt it! The Human Bean claims they are offering an attractive franchise concept that is almost unheard of in the industry: no royalty fees!!! Q:Â What are the ongoing royalty fees? The press release goes on to say: â€œNot having to pay franchise royalty fees each month means more money in the pockets of the franchisees.â€ Not necessarily; if the cost of the beans, cups, lids and other supplies are above market prices, then more money may not be left in franchisees pocket. Iâ€™m not passing judgment on the Human Bean, I donâ€™t know all the details, the stores look pretty cool, and I believe in â€œfair tradeâ€ coffee but if it sounds too good to be true it probably is! 1. Not reading, understanding or asking questions about the disclosure document. As you read the document [UFOC], keep notes on those areas that are confusing and unclear. While you may want your attorney’s opinion, give the franchisor the benefit of the doubt and first ask its representatives to explain their understanding. Then check the remainder of your concerns with your attorney…. One of the most common problems between new franchisees and the franchisor is a misunderstanding as to responsibilities. Among other things, this can cause problems in meeting the schedule for Grand Opening dates. 2. Not understanding or having an inaccurate or incomplete interpretation of the franchise agreement and other legal documents to be signed. You and your attorney should carefully review the franchise agreement, the lease or real estate agreements, and any other contracts. First, make a list of questions to go over with your attorney, then present your concerns to the franchisor. Get the franchisor’s clarifications in writing. 4. Not verifying oral representations of the franchisor. You may want to tape-record all your meetings with the franchisor. If you ask permission to do so, it is generally admissible in court if the need arises later. It also lets the company representatives know that you are tracking their words…Send a registered letter to the franchisor and a copy to the representatives memorializing your notes with a request for their response to any items you want clarified. 5. Not contacting enough current franchisees. …find out whether the franchisor has introduced you to specific franchisees compensated for their help to solicit new franchisees. Ask them….has the franchisor held up its end of the obligations regarding ongoing support assistance and training? 6. Not confirming the reasons for failed franchises. Locate some franchise outlets that are closed, sold, or have changed ownership to company-owned, and find out the reasons for their change of status. Contact the original owners and get their stories. 7. Not having enough working capital. Make sure you have enough capital to cover every cost associated with the business including all pre-opening costs, enough set aside for your family budget, and enough operating cash for the business to make it through the break-even point. 8. Not recognizing the need for financing, not knowing how to make a proper loan request and not developing a true and accurate financial statement. If business accounting is not your forte, solicit the help of a good accountant. 9. Not meeting the franchisor’s key management personnel at their headquarters and the field representative assigned to your territory. Meet the other franchisor personnel and verify the information provided by the sales representative… also meet the field representative or district supervisor that will be working with you. 10. Not analyzing your market in advance. it is still your responsibility to decide for yourself whether a particular location is desirable and promising…Do the competitors have any weaknesses that you will be able to avoid in your business to capture more market? Are the competitors so strong that their market saturation may be hard for you to penetrate? If a local competitor dominates the market, entering it may turn into a competitive struggle that will increase your working capital requirement…find out the amount of advertising and promotional dollars intended to help…Although helpful, it is not a good idea to rely totally on your franchisor for your market research…you may want your agreement to include a right of first refusal to buy additional franchised outlets in the subject territory before the franchisor considers other prospective franchisees. The suit alleges Quiznos forces franchisees to buy food and supplies from the parent company, or its affiliates, at inflated prices, but sets artificially low prices for its products. That strategy makes stores unprofitable for franchisees, according to the suit. The franchisees further allege Quiznos unlawfully sells franchises by leaving out or misrepresenting facts about its business operations. The plaintiffs seek lost investment funds in the suit. Two similar suits against Quiznos, filed by Colorado and Arizona franchisees, were dismissed by Denver District Court judges in 2005. Those cases alleged Quiznos allowed franchisees to encroach on each others’ territories, overcharged for food and supplies, and misused advertising funds. A suit filed against Quiznos by 17 New Jersey franchisees last year remains open. Quiznos seeks the dismissal of this suit. If a franchisee gets into a dispute with its franchisor, sometimes the only way to get results is through litigation. Everyone can save money if the matter is settled before trial, and each party can probably escape with legal fees of less than $10,000. Coverall North America was accused of making unfufilled promises to their franchisees. Awuah [franchisee] said in the suit that he agreed to pay Coverall $14,000 for a franchise in 2005 in exchange for its promise to provide him with $3,000 a month in commercial building cleaning business. However, Awuah said Coverall provided him typically with less than $1,300 a month. “I kept on complaining that I was not getting as much business as they had promised but they kept telling me to wait, that it’d get better but it never did so I gave it up,” Awuah said. Promises of national accounts and independent generation of business leads through sources like web sites usually turn out to be a fraction of what was promised.Â Franchisees need to plan on generating leads and business on their own, and consider any leads from the franchisor to a lucky bonus if it materializes. NexCen Brands announced that it has entered into definitive agreements to acquire two ice cream franchise systems; MaggieMooâ€™s and Marble Slab, two well known and established brands within the hand-mixed premium ice cream category. NexCen, a brand management company, is acquiring the companies for a combined initial purchase price of $37 million, plus a potential earn-out of up to $2 million upon the MaggiMooâ€™s acquisition. These two transactions are expected to be completed before the end of the first quarter and will mark the first acquisitions for NexCen in the quick service restaurant (QSR) sector. Robert Dâ€™Loren, NexCenâ€™s president and CEO, noted: â€œThese acquisitions will provide NexCen with two well positioned brands in the hand-mixed premium ice cream franchise category. With 520 existing franchises stores and 225 stores in the pipeline on a combined basis, these two brands will place us solidly as the number one player in quality and the number two player in the number of franchise units in the hand-mixed premium ice cream sector. US through our international franchise network currently operating in over 40 countries worldwide,â€ Mr Dâ€™Loren concluded. The initial purchase price for MaggieMooâ€™s is $16.1 million. The Marble Slab acquisition is costing NexCen $16 million in cash, and seller notes in aggregate principal amount of $5 million that earn interest at 6% per annum and are payable one year from closing. Three years ago on Friday, February 13th, Ground Round’s parent company shuttered its nearly 60 corporate restaurants and the chain’s headquarters. The closing stunned customers, creditors, employees and franchisees. The mass layoffs and hasty restaurant lockups on that Friday afternoon, catching scores of diners in the middle of unfinished meals, were of a scale not seen in the restaurant industry. The announcement came right before the dinner rush on a Friday, when store managers were ordered to tell diners to finish eating and pay their tabs. (Some were sent home with half-eaten meals in takeout containers.) More than 3,000 employeesâ€”some of whom had been with the restaurants for over a decadeâ€”were let go without severance, and their final paychecks bounced. A few big competitors immediately considered buying Ground Round’s assets out of bankruptcy, but during the months-long sale process, the franchisees were left to fend for themselves. They considered it crucial that the franchisee-owned restaurants all stay open during that time. Within a few weeks the franchisees elected leaders, hired a law firm, created a buying co-op, renegotiated food contractsâ€”and even introduced a new, low-carb menu. In fact, after the initial scare, being on their own had a certain revolutionary appeal. With no royalties to pay and no corporate office to answer to, life was pretty good. So a few months later, when bids started coming in, the franchisees got the idea of taking their experiment in self-government to the next logical step: Why not pool their assets and buy the company themselves? The franchisees formed the Independent Owners Cooperative, LLC (IOC) and acquired a majority of the assets of The Ground Round Inc. The assets acquired included 42 trademarks registered in the United States and Canada, all of the franchise agreements and leases related to franchised locations and franchise receivables. The debate is on in Kansas on what to do with the franchise tax currently imposed on about 16,000 small businesses in the state.Â Republicans see economic benefit in eliminating tax, while Democrats say cut jeopardizes funding obligations for discretionary and entitlement programs. Democrats argument: Itâ€™s unwise to cut taxes so much because of previously committed spending priorities for schools, senior citizens, the state pension system and roads. Republican argument: Eliminating the state franchise tax will boost to the economy, freeing businesses to expand, and would save businesses $44 million annually. Update 2-23-2007: to clarify this is in regards to the franchise tax which is currently a 0.125% tax imposed on net worths of $100,000 or more. I love the product should I invest in the franchise? I get calls from prospective franchisees that say to me â€œJim, Iâ€™m interested in this franchise because I love the product. I think its greatâ€ I guess that is as good as any reason to investigate the franchise opportunity but not a good enough reason to invest even on Valentines day. For franchising to be successful it needs to have a mutually beneficial relationship for all parties involved. This is much easier said than done. Just because they have a good product or service doesnâ€™t mean the franchise will succeed. If the franchise is set-up in a way that favors one of the parties more than the other than the franchise system is setting itself up to languish or fail. While there are many examples of successful franchises, buying a franchise business is no guarantee of success. Each year there are failures, both on the part of franchisors and franchisees. Are you willing and able to take on the responsibilities of managing your own business? You must be willing to work harder than you have perhaps ever worked before. Will you enjoy the franchise? Determine your interests and types of business activities you might really enjoy. Are you willing to completely follow the franchisorâ€™s system? People who are extremely entrepreneurial in the sense that they do not like to conform to a predetermined formula should be very careful about buying a franchise. If you have a tough time following direction than you will have a tough time as a franchisee. Can you afford the franchise? One of the major causes of business failure is under capitalization. Remember, it is better to start out with more money than you think you will need rather than less. You also need backup to support yourself and your family while you build the business. Have you carefully studied the legal documents? Franchisors are required to prepare a document called the Uniform Franchise Offering Circular (UFOC). This document will give you pertinent information about the franchise. It should be studied very carefully and discussed with your business advisors, lawyer and accountant. Does the business model work? The business model has to deliver value to all parties involved. This is one of the key factors in a successful franchise system. If the business model delivers profits to the franchisor, franchisee and value to the consumer, a mutually advantageous relationship is created and a franchise system will grow and grow. Does the franchise you are considering have a track record of success? You should get to know the principal directors of the company, their business background and how profitable their franchise has been. Are the franchisees successful? It would be worth your time to contact a number of existing franchisees to discuss their experiences with the franchise. Spend time in the locations and get comfortable with the business. Do you like the people with whom you will be working? One of the most important elements of a franchise is the ongoing support and contact you will have with the franchisor. Do you have family support? Managing a franchise is a full time job. It requires great sacrifices of personal and family time. Buying a franchise business is not a 100% guarantee of success. By carefully evaluating yourself and the franchise business you desire to purchase, the risks are minimized and the chances of success become greater. business opportunities and work-at-home scams. We’ve all see the bogus ads for quick money making opportunities (“Make $5,000 week from home working only 10 hours per week!”). Read Michael Webster’s excellent Misleading Advertising Law blog for your daily dose of provocative Due Diligence for Income Earning Opportunities. This article takes a look at the competing independents and franchise eBay dropoffs. With a couple of employees, Rodriguez estimated that his little store needs to make $12,000 to $13,000 a month just to break even. Helping him out is the fact that he is selling a lot of his own merchandise, tools and imported electronics, using the SpeedeSale log-on name to eBay. Also, he is an authorized UPS and FedEx shipper. …this is exactly what we mentioned before at Franchise Pundit – this business should be coupled with other offerings that can bring traffic in the door. The mortality rate in general is high, as the trading assistants struggle to pay rent on a storefront while trying to find the right balance: what business should they go after, what should they refuse and how much should they charge? One of Sarasota’s first drop-off stores, 1StopAuctions, has closed its doors. Its Web site, which still shows up high on search engines, is up for sale on the Net. Its owners did not return a call for comment. In South Florida, where more auction drop-off stores have existed for a longer time, Rodriguez guesstimates that the failure rate is 80 percent or more. “Of the 20 stores that used to be around two three years ago, only five are still in business,” he said. An 80% failure rate is higher than I would have guessed. But there is NO WAY a town can sustain more than a couple of eBay drop-offs, let alone 20+. All those involved in the drop-off game now realize that to succeed, they must do more than sit in their shops and wait for valuable objects to arrive. “The reason we are on Main Street is to go after business-to-business deals,” said Sun, the Snappy Auctions manager in Sarasota. Exactly. The “big and steady accounts” that will sustain you can only come from liquidating business assets. Franchises that have historically thrived consignment sales, such as Grow Biz’s…I mean Winmark’s Play it Again Sports and Plato’s Closet, stand in an excellent position because they already have the established source of inventory from the public, and now they can increase the speed of sale by coupling the in-store sales channel with an eBay auction channel. eBay drops-offs should also try to cater to wealthy customers who must always have the “new” clothes, accessories, or electronics. Those customers will regularly drop off their “old” items to you for a resale. Check out my previous post “If Students Can Do it” about students running their on-campus eBay drop-off. EntrÃ©e Vous franchisee signed his franchise agreement in May 2006 and will open with eight workers this week in Dayton, Ohio. The shop helps time-pressed consumers get dinner on the table. The shopper chooses entrees from an online menu and sets a time to come to the kitchen to prepare them or picks up pre-made dishes. Staff prepares the ingredients for the entrees. It doesn’t provide side dishes. The entrees serve between four and six and cost $21 each, about $3.50 per diner. Martin said customers must buy at least six entrees per month, which costs about $115. While the menu changes, the 14 entrees available this month include Chicken Wellington, Seafood Paella and Sesame Pork Stir Fry. The linked article above is confusing because it says the chef-founder formed EntrÃ©e Vous in 2006, but I saw advertisement that claims EntrÃ©e Vous was formed in 2003. My guess is the entity doing the franchsising was formed in 2006, but the chef operated a similar concept during the previous 3 years. To be honest, the picture above looks like a Chinese take-out, but I guess you can only dress up a 1,500 square feet strip-mall location so much. There is a lengthy discussion and debate in the forum regarding Meal Assembly franchises, Super Suppers in particular. Check it out for more perspective. You have probably seen their big orange ads screaming “We buy UGLY homes!”. HomeVestors purchases homes at below market value, targeting homeowners that need to sell quickly, rehabilitates the properties and sells at a higher price. . This interview with the CEO walks through a few aspects of the franchise. What do you think of TV shows like “Flip This House”? In one episode of one of those shows, an investor goes up to a house, and the house is locked, but he wants to look at it. He says, “We’ll have to take matters into our own hands,” and kicks in the door and smiles at the camera. He just violated the lawâ€”that’s trespassing, and our franchisees aren’t able to do that. That’s the wrong image to give lawmakers, consumers and consumer lobbying groups about this business. I get agitated about what I see on these shows. People get the wrong ideaâ€”that you can buy a house, flip it and make $50,000 on it. So I don’t watch those programs too often. A disciplined, systematized, ethical approach to flipping homes is the way to go in this business, whether that be on your own or with a franchise.Â Homevestors’ system does things in a legitimate manner, unlike some home flippers. The erratic real estate market of late makes profits unpredictable, and sometimes finding homes 30% below market value difficult.Â New government regulations could blind-sided franchisees as politicians try to buffer the profits from aggressive flippers. When a franchisee closes it’s doors and walks away from the six-figure investment, it’s almost always about the unsustainably low sales. Does anyone believe the dodgey â€œWe just chose to no longer be a franchisee of Qdobaâ€™sâ€ excuse by Qdoba Mexican Grill franchisee? At say, “It is for personal reasons, unrelated to the performance of the business”, or “The location did not provide us with enough traffic in the non-lunch hours to cover the high lease payments”, or whatever the real reason may be. 100-unit Potbelly’s, who recruited DeLuca from Starbucks as an investor and board member, is planning to raise money in the public capital markets with an IPO in the 3rd quarter of 2007. Chicagoans have been enjoying Potbelly’s toasty-warm sandwiches, fresh homemade desserts, and old-fashioned milkshakes at the original Lincoln Avenue store since 1977. The original stand was in an antique shop, formed to feed and attract hungry locals to browse the atiques. Current owner Bryant Keil purchased the business in 1996, and has since expanded its presence to Washington DC, Virginia, Maryland, Wisconsin, Michigan, Minneapolis, Ohio, and Texas. Potbelly has over 100 company owned-locations and the growth continues, albeit at an intentionally steady, controlled pace. 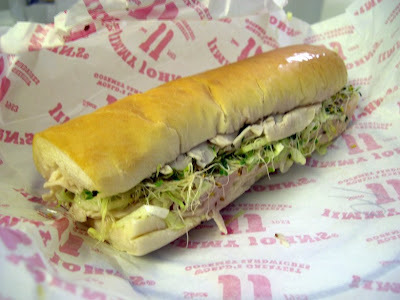 Jimmy John’s (“JJ”) franchisees are happy because they make money and get decent support from the franchisor. The failure rate is very low, particulary in the past 5 years, if you follow the sytem. It is rumored that a single unit, on average, achieves $850,000 in annual sales, with breakeven reached usually with annual sales of $400,000-$420,000 (depending mainly on the lease). The latest numbers are over 500 restaurants in operation (20 company owned) with 1016 franchise agreements signed. A new JJ is opened every 36 hours as of January. Most of the franchisees now are area developers, but sometimes single-units are sold. JJ has a well tuned but quirky fun system to make it ‘happen’. The operation manual is specific to every last detail, to how you put on your apron. The headquarters has rock music playing, Plasma TVs with Fox News on full time, and very casual but go-getter attitude. The founder recently sold a third of his business to a Weston Presidio, a famous private equity fund who funded Starbucks, Jet Blue, Wild Oats and Guitar Center, but founder Jimmy John Liautaud still has a 4-to-2 vote lead on the board.Â Liautaud’s 29-year-old President is the 3rd largest shareholder. On of JJ quirky but effective marketing approaches is an in-your-face attitude in the store and in their infrequent advertising. A second unique aspect is JJ’s Franchise Consultants, who visit stores with supplies (tile glue, cleaners, mits, pans, etc.) to clean up and fix up shops, all while encouraging the owner. A third unique aspect is its use of more than a dozen guerilla marketkers who will visit one location and spend 4 days there. The first day is planning for the massive 3,000 sample distribution strategy over the next few days, the second day is giving out samples, the next two days is giving out more samples if possible and then helping the franchisee make sandwhiches. Orders usually increase by 60+% and strongly stay above pervious levels therafter. This isn’t a commercial, no one is paying or asking me to write this – it’s my unbiased opinion. I’d buy it! I lived in South Florida for about a year and regularly ate at the Chicken Kitchen (background article). The restaurant flame roasts chicken on a very large open grille for all guests to see, and then chops up the whole chickens for plates, bowls or burritos. The bowls were quite healthy, filling and reasonably priced. Chicken Kitchen was recently involved in a nail-biter law suit. One of its franchisees caused a serious auto accident. Who was liable? Only the driver and franchisee, or also the franchisor? Plaintiff (P): Joshua S, motorcycle rider hit; represented by lead attorney Ervin A. Gonzalez with assistance from Deborah Gander. Defendant (D): Chicken Kitchen USA LLC; represented by Frank Alloca and Bill Davis of the law firm Buchanan Ingersoll & Rooney in Miami. Facts: An employee of D’s franchisee was driving to make food deliveries for its restaurant. P was driving down the street in his motorcycle with friends. The franchisee’s driver hit P, causing severe neurological damage and the loss of his right arm. P’s Claim: The Miami franchisee was an independent contractor, and it was therefore not responsible for any of the franchiseeâ€™s actions and omissions. Issue: Is a franchisor legally responsible for the actions of its franchisee’s employee when the employee crashes a stop sign and causes bodily injury? Reasoning: Chicken Kitchen USA is legally responsible for the acts and omissions of its franchisee because it controlled or had the right to control the day to day business activities of its franchisee pursuant to its franchise agreement and operating manual. The jury subsequently award Joshua S $2 million. I’m not sure whether insurance covered Chicken Kitchen USA LLC for its liability.